10.november slipper Greenpeace Kanada en konsert-CD med dobbel historisk betydning. »Amtchitka- The 1970 Concert that launched Greenpeace« dokumenterer en konsert med Joni Mitchell, James Taylor og Phil Ochs i Alaska-byen Amchitka, en protestkonsert mot amerikanske atomprøvesprengninger i området. Konserten ga støtet til miljøbevegelsen som fortsatt er svært aktiv. Både Taylor og Mitchell var i ferd med å få sine store gjennombrudd som artister, mens Phil Ochs var veteranen som hadde bakgrunn som Dylan-kollega på sekstitallet. Ochs begikk selvmord i 1976, bare 35 år gammel. 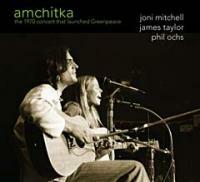 Greenpeace Canada is set to release an exclusive two-disc, re-mastered live recording of »Amchitka - The 1970 Concert That Launched Greenpeace«, featuring Joni Mitchell, James Taylor and the late Phil Ochs. The concert, a fundraiser to protest U.S. nuclear bomb tests near Amchitka, Alaska sees a first-time release on 10 November. The CD is available exclusively through Greenpeace and all proceeds will benefit the organization. “We are pleased to offer this musical slice of history to Greenpeace supporters and music lovers around the world,” said Bruce Cox, Greenpeace Canada’s executive director. “This CD is a piece of musical magic. It contains never before heard songs, duets and chatter that capture the confidence and hope of the times. It carries a timeless message that change is possible.” The concert, which took place at the Pacific Coliseum in Vancouver, British Columbia on 16 October 1970, was organized by former trial lawyer and activist Irving Stowe. As co-director of the 'Don’t Make A Wave Committee', he raised enough money to send 11 peace activists by boat, christened The Greenpeace, to the Aleutian Island of Amchitka. The activists were unsuccessful in stopping the tests, but their voyage in 1971 marks the birth of the worldwide organization known today as Greenpeace. The upcoming release features concert performances by then-rising Canadian star Joni Mitchell and a 22-year old James Taylor. Protest singer, Phil Ochs kicks off the CD. Earlier that year Mitchell had been named Top Female Performer of 1970 by Melody Maker magazine and Taylor had released his major breakthrough album »Sweet Baby James«.